Tariku Shiferaw’s work ranges from the body to Hip-Hop to Minimalism. He describes some of his paintings as “torso-sized.” Generally, the paintings reflect his coloration, that is to say, black and blue, patterned in horizontal stripes––marks that both assert a presence and redact a surface. 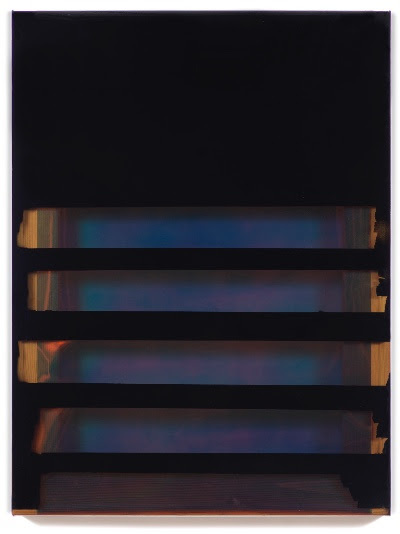 Unlike Agnes Martin or Daniel Buren, Shiferaw’s stripes are, at least in part, referential, having been first derived from the slats on shipping pallets, a potent image when one considers that the artist is an African immigrant. He describes his upbringing in LA as divided between two parallel identities: at home, his mother’s little Ethiopian boy; in society, an African-American where he is “black”. We say this because color is an important element in Shiferaw’s work; black is certainly not a void, nor emptiness, but a designation, a label, and it seems most so when framed by gleaming white gallery walls. At Cathouse Proper, in this regard, expect to see his works installed with intention. Like his upbringing, his approach to making is also divided. The paintings––mostly acrylic paint on stretched plastic––aesthetically fall into the genre of Minimal-Expressionism; however, they are always titled after songs from Hip-Hop, R&B, Blues, Jazz, or Reggae. Shiferaw ascribes equal value to the title as to the physical piece. One begins to wonder, therefore, if the paintings are made as much for their inherent beauty as to smuggle into the white gallery, like contraband, the referenced songs’ lyrics, culture and people? Tariku Shiferaw (b. 1983, Addis Ababa, Ethiopia) explores mark-making in order to address the physical and metaphysical spaces of painting and societal structures. Shiferaw was raised in Los Angeles where he earned his BFA from the University of Southern California in 2007. In 2015, he received his MFA from Parsons School of Design. Recent exhibitions include the 2017 Whitney Biennial as part of Occupy Museum’s Debtfair; a group exhibition titled A Poet*hical Wager at Museum of Contemporary Art Cleveland; and a solo show, Erase Me, at Addis Fine Art, London project space. Shiferaw currently lives and works in New York.